50 inch UHD Outdoor TV Silver Patio Series. Our Silver Patio Series is the affordable alternative to just installing a “Regular Indoor TV” in an outdoor environment. 55" UHD QLED Outdoor TV Diamond Q Series. Introducing our MirageVision MV-DQ (4k) Series, (Product of the Year Winner | CEDIA Show 2017, by Residential Systems Magazine ) This series was developed for Hi-End Residential Use. 55" LCD Full HD Outdoor TV OHF Series. Our Samsung OH Outdoor models that are directly from Samsung. These outdoor models are manufactured and warranted by Samsung, and are made for commercial and residential hi-end applications. 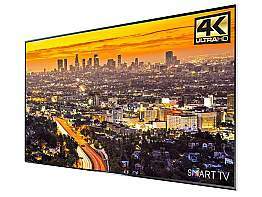 55" UHD LCD Outdoor TV Platinum Series. The MirageVision Platinum Ultra HD (4k) Series was developed for Hi-End Residential Use only. All models in the series are UHD (4k) Smart TVs with WIFI and Apps. 55 inch UHD Outdoor TV Silver Series. Our Silver Patio Series is the affordable alternative to just installing a “Regular Indoor TV” in an outdoor environment. 65" UHD QLED Outdoor TV Diamond Q Series. Introducing our MirageVision MV-DQ (4k) Series, (Product of the Year Winner | CEDIA Show 2017, by Residential Systems Magazine ) This series was developed for Hi-End Residential Use. Outdoor TV’s are designed and engineered to face all-weather conditions such as rain, dirt, snow, as well as UV rays from the sun. The ability to deliver a TV’s superior brightness and balanced contrast outdoors with an outdoor LED or LCD screen is the challenge manufacturers have to face. Our partnership with SunBriteTV, a reputable True Outdoor Television brand that engineers, assembles, and designs these outdoors displays in Thousand Oaks, CA, have been developing outdoors TV’s for many years. The durability and toughness of their television designs are a result of the tests that have occurred throughout the harshest Northern CA climates. SunBriteTV is the choice of many professional sports stadiums including Soldier Field, Gillette Stadium, Wrigley Field, and many others. Our customer care agents are standing by to answer questions you may have regarding outdoor TVs.